Provides a wide variety of analytics capabilities including descriptive statistics, linear regression and presentation-quality graphing and reporting. Access multiple data formats without size constraints. Advanced data preparation capabilities also enable you to eliminate labor-intensive manual checks. 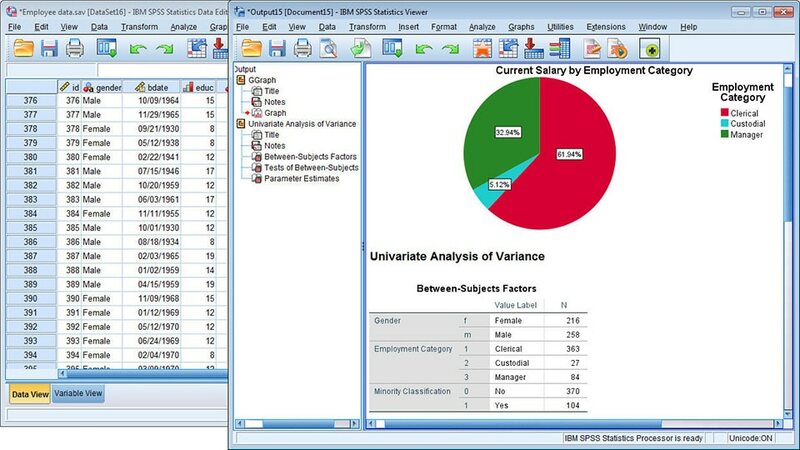 Leverage bivariate statistics procedures, factor and cluster analysis as well as bootstrapping. Further extend your capabilities with R/Python. Enables you to summarize and display your analyses in production-ready tables, exportable to Microsoft or PDF. Present survey results using nesting, stacking and multiple response categories, and manage missing values. Also provides univariate and multivariate analytical techniques and models to improve the accuracy of your analyses. Includes non-linear and general linear models and mixed model procedures as well as logistic, 2-stage least squares regression and survival analysis. Helps you compute statistics and standard errors from small or complex sample designs. Predict numerical and categorical outcomes from non-simple random samples, and account for up to three stages when analyzing data from a multistage design. Also enables you to access regression with optimal scaling including lasso and elastic net. Additional features include categorical principal components analysis, multidimensional scaling and unfolding, and multiple correspondence analysis. Enables you to develop forecasts and predict trends using time-series data. Includes ARIMA and exponential smoothing forecasting capabilities. Automate model parameters, and test your data for intermittency and missing values. Also features decision trees, based on four tree-growing algorithms, to help you present categorical results and discover relationships between groups. As well, allows you to create neural network predictive models and RFM analysis to test marketing campaigns. New advanced features include random effects solution results (GENLINMIXED), robust standard errors (GLM/UNIANOVA) and profile plots with error bars. Also now supports Bayesian statistics, an alternative method of statistical inference. This feature includes new syntax and GUI elements that are easy to run. Also updated are powerful new charting capabilities such as new default templates and the ability to easily share with Microsoft Office applications. For a full list, follow the CTA below.